Being from Pittsburgh PA I will always be a Steelers Fan. I feel very lucky to have grown up there back in the day when Terry Bradshaw, Lynn Swan and Franco Harris were winning the Super Bowls. Sports in Pittsburgh is number one. But now I live in Colorado and it is my home so I am also a Broncos fan. The last game was great with the Steelers and the Broncos. It was win win for me. So now the Broncos go forward and it is playoff game day and I am in Broncos Country. So here’s to my home team! Instead of black and gold, it is all orange today! Go Broncos! 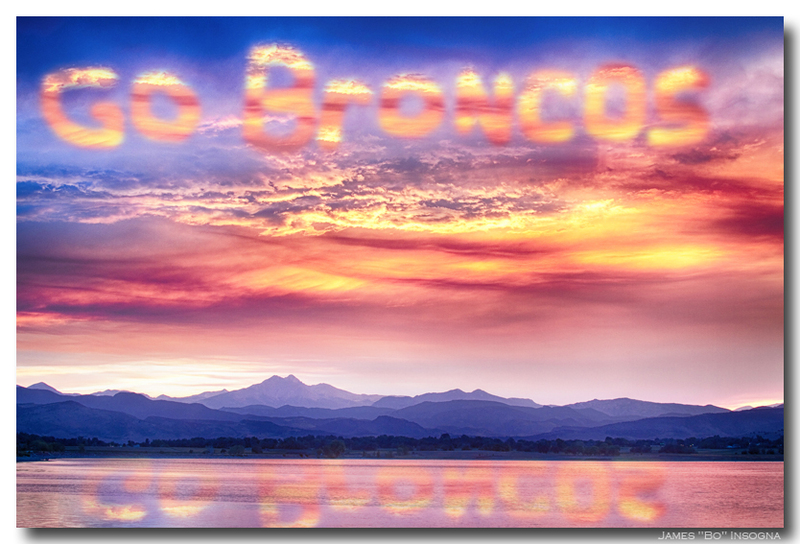 A composite sunset of the Colorado Rocky Mountains with a view over McIntosh Lake of the Twin Peaks, Mt Meeker 13,911 ft and Longs Peak 14,256 ft and go Broncos written in the sky. Colorado fine art nature landscape photography fine art prints, canvas prints, acrylic prints, metal prints and photo images for licensing by James Bo Insogna (C) – All Rights Reserved.